Share this story with CNN. Go to iReport and post your viewing experience on video. Copiapo, Chile (CNN) -- His return heralded by a siren's blare and the cries of a happy nation, the first of 33 Chilean miners emerged into a cool desert night early Wednesday after being trapped underground for 69 harrowing days. Florencio Avalos made the bumpy 20-minute ride to the surface as eager family members and anxious strangers watched from around the world the developments at the San Jose mine. He emerged wearing green coveralls, blinking in the bright lights and to the cheers and applause of the rescue team. Avalos, beamed as he walked on the earth's surface for the first time in more than two months. Wearing sunglasses he hugged his family and then Chilean President Sebastian Pinera. He appeared strong, walking without help and embracing many of the rescue workers who witnessed his arrival. He was then put on a gurney and wheeled into a separate room where doctors will examine him. The 31-year-old miner became a cameraman during the isolation, filming videos of the miners to be sent up to rescuers and relatives at the surface. His brother, Renan Silva, is also trapped in the mine. A joyous celebration burst out in the capital, Santiago, as hundreds watched on a big screen TV set up in a square -- there were hugs and tears. "I'm very anxious, I'm very happy," Avalos' mother, Maria Silva, told CNN Chile ahead of the rescue. In the hours before the highly anticipated rescue, the sounds of the site were those of a construction site as last-minute preparations were made. Drilling, beeping, rumbling and hammering filled the air at the mine site. Chile is a country that reacts well to adversity, Pinera said, though he added that the miners will not be the same once they come out of the mine, and Chile, too, is changed. With Avalos' arrival to the surface, 32 miners remain in the gold and copper mine where they have been trapped since the start of August. One by one, they too will put on green coveralls made of moisture-resisting material and personalized with names like Raul Bustos. Juan Illanes. Alex Vega. The oldest is 63. The youngest, only 18. The miners will also have on fresh underwear and socks when they climb into a claustrophobic capsule only a little wider than the span of their shoulders. They will be instructed on the communications equipment and the oxygen supply inside the rescue tube. And they will put on special goggles to protect their eyes -- which have become accustomed to the vampiric darkness of the caved-in mine -- from the lights up above. Then the order to hoist will ring out and each man will begin a slow, bumpy, upward journey through half a mile of rock. Chilean Health Minister Jaime Manalich told families not to panic when they heard the siren. In this case, it was not being used for something bad, he said, only to herald the arrival of a moment as joyous as a baby's entrance into he world. The miners have been placed on liquid diets in case they vomit on the way to the surface and they have been exercising for an hour a day. Yonni Barrios, is a paramedic and has been weighing his fellow miners daily, taking blood tests and doing daily urine analyses. The others call him "Dr. House" after the television show, which is popular in Chile. The rescue is likely to go from night into day. Some of the men will feel the intense chill of a desert night; others may come out to a searing sun burning high in a cloudless sky. The rescue capsule will spin as it rises. It will be harrowing. And dark. Like a scary amusement park ride. Except the thrill for these 33 men will lie at the end of the ride, when each will see the families they probably feared they would never see again. "As he comes out he will be reborn," Nelly Bugueno said of her son Victor Zamora, 33, who helped handle the cylinders -- called carrier pigeons -- that brought food and other supplies to the trapped miners. Her son is also a poet. Nelly Bugueno has been camping out with the other families above the caved-in mine in this spartan area void of hotels, gas stations or any other amenities. They named the place Camp Esperanza (Hope). Tuesday, that hope was apparent as the families sang songs and could not contain the joy of long-awaited reunions. Thirty-three flags hung from a red school house -- 32 Chilean and a single Bolivian -- representing the nationalities of the men buried underneath. 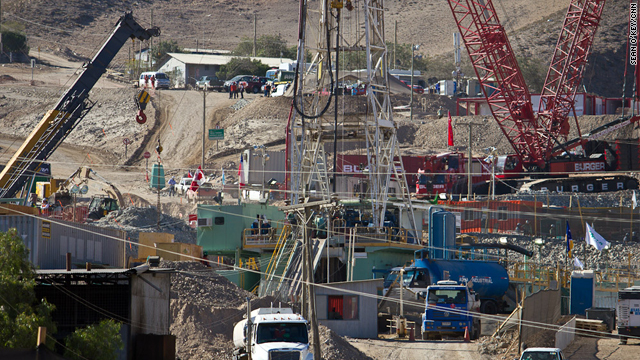 Bolivian President Evo Morales is expected at the mine site Wednesday to show his support. "God is in all places, At the same time your family loves you," read a sign for Mario Gomez, the oldest of the miners. Gomez began mining at the tender age of 12. He became a spiritual leader for the trapped men and requested a crucifix and statuettes of saints so the men could construct a shrine inside the mine. But amid hope also lurked fear. What if something went wrong? Claudio Lobos craved reassurance. His brother Franklin Lobos, 53, once played soccer in a Chilean professional league and served as an electrician in the mine. The mine collapsed as he and Jorge Galleguillos drove a truck deep down inside the shafts. They slowed down to look at a small white butterfly that had somehow gotten in the mine, and just ahead of them the rocks began caving in. It saved their lives, they said. If only the journey back was guaranteed to be as lucky. The rescue cage looked small to Claudio. Would his brother fit in there? Was it safe? he asked journalists. He was told the Chilean government has used every resource to save his brother. What more could journalists say? The first to come out will be five miners who have been deemed fit and who possess the most technical know-how so that they can advise the rescue teams. The next five will be the physically weakest, a term perhaps not appropriate for anyone who has survived more than two months in the bowels of the earth. But one of the miners has diabetes; another has black lung. The last to come out will be Luis Alberto Iribarren, 54. Like the captain of a sinking ship, the shift supervisor volunteered to stay behind until all his men were safe. As the men are extracted, they will undergo about two hours of health checks at a field hospital set up at the mine. They will then be flown by helicopter to a hospital in the town of Copiapo -- approximately a 15-minute flight. Miners who are healthy enough will be allowed to visit briefly with family members in a reunion area before being taken to the hospital. Some have exhibited anxiety, according to Manalich, the health minister. They may experience psychological problems. For the 33 men, the only contact with the outside world since the beginning of August was through a small bore hole through which they were sent food, water and other supplies. A letter sent by one of them said they would take a vow of silence, to never to fully reveal the details of their underground misery. Edison Pena, 34, sent back a request for Elvis Presley music and led the group in sing-alongs. Victor Segovia, 48, kept a journal throughout the ordeal and sent his updates to help keep the rescuers on the surface informed about the miners' well-being. He's an acoustics expert. Jimmy Sanchez, 18, the youngest miner who worked as an environmental assistant, sent a letter to his mother. He just wanted to taste her cooking again. Ariel Ticona, 29, watched his wife give birth to a baby girl via a video link that was lowered into the mine. Of his three children, this was the first birth he was able to witness. They called their new daughter Esperanza. High above the miners, the buzz of electrical generators brought in by hordes of media began to drown out other sounds Tuesday. About 1,500 journalists from 39 nations gathered to tell a story of survival and family members held their breath. And as Avalos surfaced Wednesday, safe and sound, a nation exhaled. CNN's Moni Basu, Karl Penhaul, Patrick Oppmann, Gary Tuchman and Luis Carlos Velez contributed to this report. "I buried 40 years of my life down there," says Mario Sepulveda. "I was with God, and I was with the devil."